The fourteen day safari package has a lot of activities including game drives, nature walks, hiking, village visits, community activities, birding and so much more. One of the most popular sites on this safari is the migratory animals in the north of the Serengeti at the Mara River. You will be met by one of our guides at the airport and transferred to Arusha town where you will spend the night. early morning, after breakfast, you will start off your adventure with a drive to Mto Wa Mbu near Lake Manyara National Park. Explore the cultural village and experience the lifestyle of the locals. Break off for lunch, and then move on to Lake Manyara national park. The park is named after Lake Manyara and lies in the middle of the great African valley. The park has a variety animals and bird life, so spend the afternoon on a game drive, do some bird watching, and a nature walk. You will see quite a lot and probably get some good pictures taken. On day three you will explore more of Lake Manyara national park, and move on the magnificent lake Natron. 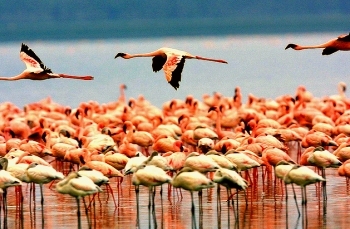 Lake Natron is the largest alkaline lake and has a very impressive population of flamingoes. There are a couple of activities you can take on; you can go on a walk with the Masai and follow the escarpment to the source of the Engaresero river, and get a good view of the magnificent waterfalls. You can also drive to Lake Natron and follow the flamingoes take some pictures. the Serengeti is one of the most magnificent and rich pieces of African wilderness. Exploring the landscape, seeing all the wildlife in its variety, all the birds, plants, exotic trees, rugged plains and enjoying the African sun in this piece of heaven is one memorable adventure you will want to capture in pictures. Early morning on day four, after breakfast you will drive to the northern part of the Serengeti. Here you will see some very beautiful scenery, enjoy a game drive, see some Masai pastoralists going about their everyday life. You might also catch sight of some of the wildebeest migration action. See hundreds of zebras, gazelles, and wildebeests making their way across the plains either from Serengeti to Masai Mara or in the opposite direction depending on what time the year you are visiting. On days five and six you will continue your tour of northern Serengeti, it’s the area where the wildebeests cross the Mara River, so more time spent in the area means more to see. The Mara River also has quite a population of hippos and crocodiles. On the game drives in this section of the park, you will see animals such as leopards, lions, hyenas, scavengers and of course numerous herbivores, including several migratory animals. On day seven, you move your exploration to South Central Serengeti. The animals in south central Serengeti depend on the Seronera River for drinking water during season when all the migratory animals have moved on to the Maasai Mara plains. This section also has a variety of wildlife and some interesting plants and trees. Explore, enjoy, and take amazing photographs to prove you were there. an early breakfast and one last early morning game drive in south central Serengeti is how day 8 starts, and then it’s off to Ngorongoro. On your way to Ngorongoro you will visit archeological and historical site- the Olduvai Gorge, and also make a stop to visit Masai village, where a population of Masai people have been living in the Ngorongoro area for over 300 years. After breakfast the next day you will descend to the floor of the crater for a full day of game drives, walks and simply exploring the Ngorongoro crater. The crater floor has thousands of wildlife herbivores, carnivores and predators of all sizes, birds, and some interesting portions of vegetation. You will even get to see the rare black rhino and several other animals such as the big bull elephants, buffaloes, leopards, etc. For lunch, you can enjoy a picnic at the Ngoitoktok picnic site on the floor of the crater in the middle of the wild. your next stop is Lake Eyasi. After breakfast on day 10, you will proceed to Lake Eyasi. You will probably arrive just in time to have lunch and then enjoy a relaxing walk along the camp to get the lake view from the camp. On your Lake Eyasi visit, you will enjoy some cultural activities with a couple of the tribes that live in the area. You will visit the Datoga, Black Smith and Bushmen who are hunters and gatherers. Hunting for food, and gathering edible fruits and roots is a big part of their way of life. During your time here you will visit their villages and interact with them. See how they live, prepare to hunt, and hunt. You can go on a hunt with them and see how its done first hand. Then you will also spend sometime with the blacksmiths and see how they to spend their work days and live. Of course there will be time to tour the Lake Eyasi shores, and enjoy seeing the lake up close. These two days will be spent enroute to and exploring Tarangire national Park. on your way to Tarangire you will pass by Mto wa Mbu a multi cultural area in Tanzania. You can stop and explore the village and interact with the people. In Tarangire you will go on some very enjoyable game drives, nature walks, and if you enjoy birding, the park has a variety of bird species as well. The park is named after the Tarangire River which is a water source to the animals in the area especially during the dry season. On this last day of your safari, you will go on one last game drive in Tarangire national park, before leaving and heading back to Arusha. From Arusha town you will be driven to the airport and then you’ll be on your way home.